Please note down the following dates for the this years work parties. Please try to attend at least one to help in any way that you can with the work. 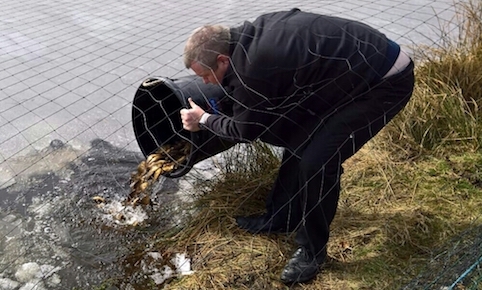 Netting of stock pond (pump required - A.A.). Inlet shut off Thursday/Friday to drop water level. Screw boards down on bridges and cover in chicken wire. Remove structure from stock pond. Dig out right hand side of bridge (Joe with digger) and inlet to stock pond. Fit new gate below stock pond (Joe to source). Install baskets - Match lake and Specimen pond. General tidy up and clear paths. Take reeds back and transfer to Specimen pond. Look at fencing on field side (cows). This is a short appeal to all members to help wherever possible with the problem of predation by cormorants on our waters. We currently have a number of measures in place to deter these birds from landing and taking our fish stock, but the best one by far is people presence. If you have 10 minutes to spare just to walk around our ponds it could make a big difference in protecting our fish. The dates for the challenge matches against Rochdale Waltons have now been arranged for the 30th June at Waltons in Healey Dell and the 14th July at Lane Head. Membership's for 2019 are now available from Rochdale Angling! Why not gift one for Christmas! The keep net ban has now been lifted on all our waters. However, please place nets out behind you peg when you arrive to expose them to UV light to help fight the spread of KHV. Congratulations go to Craig Gorton in becoming the Club Champion for 2018, winning the league by a single point from Simon Newsham. Have you ever thought about joining the Angling Trust as an individual member? Well now is a great time to do so as they are offering a fantastic deal. Basically you get the cost of your membership back to spend at the FishingMegastore.com!!! If you are interested click on this….Angling Trust Individual Membership Deal for full details. In a very wet last match of the Junior season, Cain Blackburn finished off in great style by breaking the match record for the second time this season! Congratulations go to Cain for winning the league for the second year running. We are pleased to announce that at the August meeting, Colin Whitehead was voted in as the new Chairman of the Society. Please support Colin in his new role. Please be aware that during matches at Lane Head, cones will be placed hallway up the ramp to the car park to stop access and egress. This is to avoid disturbance at that end of the lake. Also bank walking will not be permitted during the match. For those wanting to fish the Specimen lake please park on the car park prior to 8am (leaving after 3pm) otherwise you can drop your gear at the gate, turn round using the ramp and park at the top of the lane. Please be aware that Un-hooking mats are required when fishing the Specimen Lake at Lane Head. We are sad to announce the resignation of the Society's Chairman, Mick Barker. Mick was a co-founder of the Society in 1973 and will be sadly missed. Anyone wishing to put themselves forward for this post, please contact the Secretary. The new fish for Broadley Wood were delivered today. Probably around 7 - 8 thousand (we didn't fancy counting them!) comprising mostly small roach but with skimmers, perch and gudgeon also included. Just a gentle reminder fro everyone to check the expiry of their Environment Agency rod license. Im posting this because I suddenly thought about it on Saturday, only to find that mine expired that day! Follow the link in the side bar of this page (at the bottom of your screen on mobile devices) or on our homepage. Fines of up to £2,500 can be imposed on anyone caught fishing without one. 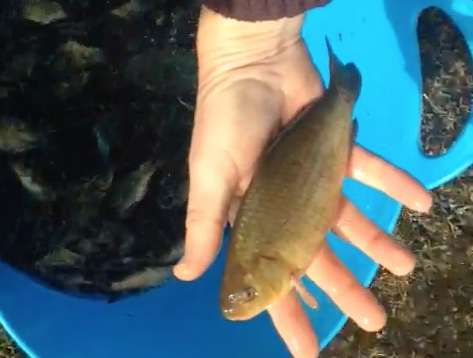 One thousand Crucian carp were delivered today and looked fantastic! 75% went into the stock pond and the remainder in the main lake. The netting of the stock pond was a great success, although the conditions were rather cold for Mick and Eddy who were in the water! 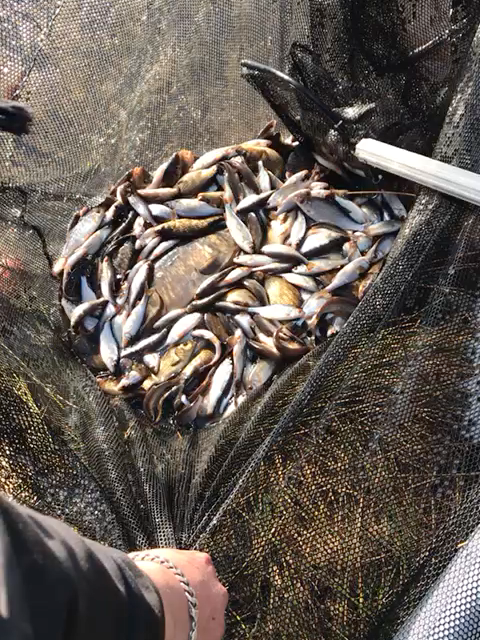 We moved literally thousands of fish down to the main lake - roach, skimmers and carp. This was probably in the region 200 to 250lb. Click here for the YouTube video. Remember to Subscribe to get new video uploads. On Wednesday the 28th, (weather permitting?) we will take delivery of 1000 Crucian carp, for the stock pond, although we will introduce a small proportion of them into the main lake. We understand from Farnley Fish Farm that these Crucians will spawn this year as they are full of eggs/milt which is a real bonus. As usual, these will be brought on in the stock pond by regular feeding. The net above was only a small proportion of the fish transferred! A second delivery from Farnley of several thousand roach and skimmers will follow (date to be decided) and these will go in Broadley Wood. The Junior outing has now been organised for Saturday, 22nd September. After the success of last years trip we will return to Bradshaw Hall Fisheries, once again fishing Lake 3. Please be aware that the 2018 Match List has been changed. The junior match which was to be held on the 9th June has been moved to the 16th June. The Senior & Junior Match Lists are now available for 2018 & 2019. Please download a copy by clicking here on the year or from the Match Fishing Page. Please remember to renew your membership for 2018. Memberships run from the 1st of January until the 31st December each year. Rochdale Angling now have the new membership cards for 2018. For renewal of membership you will need to present both cards (2017 card and membership card with photo ID). Your photograph will be transferred to the new card unless you wish to provide a new photo. For new memberships you can download a form or obtain one from Rochdale Angling and complete it when joining. Again remember to take a passport size photo for you card. As in the past, you can join through the subscriptions Secretary, Andy Andrews whose contact details are in the membership section. On Sunday, 12th December the Society held this years Trophy presentation for the Senior and Junior matches at the Whitworth Football & Cricket Club. Some photo's of the Junior winners can be found on the Junior Match Fishing web page. I think that it's fair to say that it was an outstanding success and was enjoyed by all who attended! The Society would like to thank the club for allowing us to host it there, and to Amy, for all her work in providing a fantastic buffet. Also a big thank you to Rochdale Angling for the donation of a reel. Please help to support your local tackle shop by shopping there for your tackle and bait if at all possible. You always can get friendly service and good advice, and they normally can match or come close to prices found on the internet, so please just go in and ask! Unfortunately KHV has affected some fisheries in the North West, so once again could we please remind everyone to dry all nets including landing nets and carp mats on the bank for at least 30 minutes before fishing. UV light kills the virus and will help prevent the spread of this deadly disease. The Society are looking to appoint a bailiff for our new Broadgate water. Obviously this needs to be a member who fishes there regularly. Anyone who is interested should contact the Secretary for more details (mob. 07964 793898). Free ongoing membership would be available for the person who fills the role. We have a shortage of photographs for the website of large carp caught from our waters. If you have any recent photographs we would be really pleased to add these to the website. Contact details are available on the 'Photo's page. We are still getting complaints from the farmer, about the small gates being left open on the specimen pond at Lane Head. Please can you ensure that these are closed behind you. Please remember that the farmer has the last say on whether to allow night fishing. Night fishing is ONLY allowed upon request with him, so we do not want to upset him otherwise it could spoil it for everyone. It has been brought to the committee's attention that some anglers are using more than 2 rods. Please can we remind anglers that a maximum of two rods only are allowed on WVAS waters. This is stated under item .d. of the Appendix in the Clubs Constitution (Society Byelaws), which states, 'Any number of rods may be set-up, but a maximum of two rods are to be used at any one time’.